The ProtoZero - now on Kickstarter! This week I’ve been secretly working away filming, writing up and pricing a prototyping board that I designed for the new Pi Zero – the ProtoZero. It’s now been released on Kickstarter, so I thought I better write something about it here on my blog! I originally designed the board when the Pi Zero first came out, and received my prototypes from OSH Park a few days back. I was lucky in that only minor cosmetic changes are required for my design, meaning it was good to be Kickstarted as soon as I could get everything written up. The campaign has now been launched – you can pledge to have your very own ProtoZero (or 2,3,4,5 of them!). 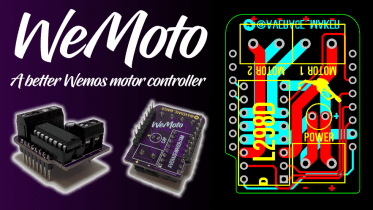 This latest design under my ProtoBoards brand is all about prototyping, and more specifically moving your breadboard projects to something less messy and more useful. I love it when a Raspberry Pi project works as designed, but that buzz soon fades when I realise that the really cool and useful thing I’ve made is stuck to a breadboard with a spaghetti of loose jumper wires hanging out of it. You can’t take it anywhere, you dare move it for fear of a wire coming loose and they take up a lot of space. That’s why I love prototyping boards. With a little planning and forward thinking, you can easily move your messy breadboard project to a PCB. When the Pi Zero came out I knew it would only be a matter of minutes before I started to design a prototyping board for it. It’s just too small and low profile to not have a decent prototyping board available! It’s small. It’s cool. It fits in your nostril. What more could you want? I followed my usual approach with the ProtoZero – make use of as much PCB board as possible, and keep it simple. My new creation has 154 prototyping pads squeezed on to the little Pi Zero sized board, which are also in breadboard-style ‘lanes’ to make it even easier to solder your connections. These lanes are printed on both sides to give you a hand when soldering. The Pi’s GPIO is connected via the supplied female 40-pin header, and is then broken out again to allow you to connect components directly. I’ve also labelled the GPIO pins (which I’ll be revising to make them larger and clearer) on both sides of the board to help you when soldering. Let’s be clear – the ProtoZero is not officially a HAT. For starters, to be classed as a HAT a product needs to have an EEPROM chip. This doesn’t. 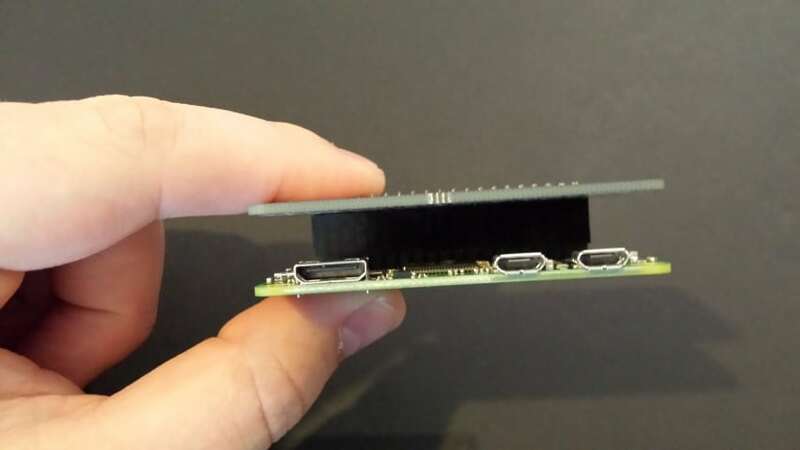 I don’t really get the whole HAT thing and EEPROMs etc – for me the best part about the HAT format is that you always have mounting holes to stack boards. The ProtoZero comes with these holes so is compatible to be fitted alongside other Pi Zero HATs (as long as you fit a stacking header). The ProtoZero can be stacked, allowing you to add different components to different layers, all connected to the same GPIO. 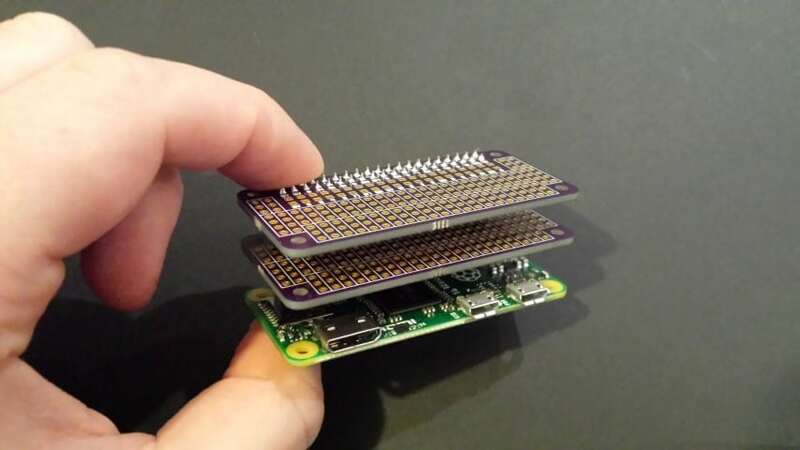 The Kickstarter version doesn’t come with a stacking header as the design is more geared towards the Pi Zero’s small size and low profile, but if you want to buy a £1 stacking header and use that – go for it! 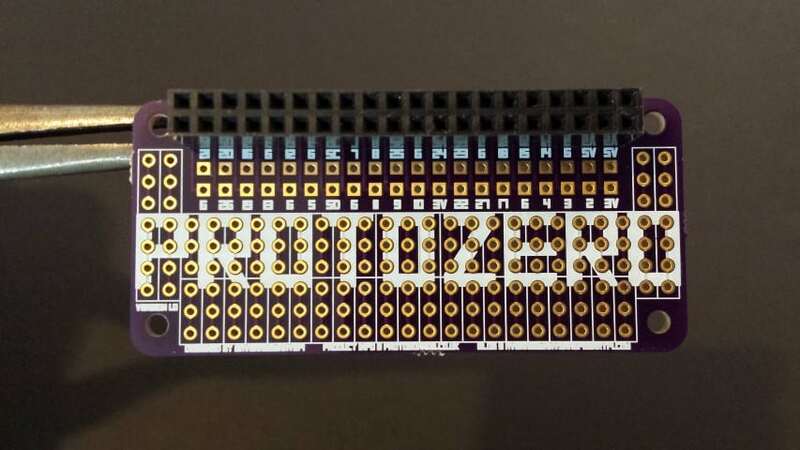 I experimented with large print text over the rear of the board this time as a) I wanted to see how it would look and b) there wasn’t much room left on the tiny board for the ‘ProtoZero’ name to be added. I’m sure opinion will be mixed on the look of the rear of the board, but I just love the big text label hogging all those prototyping pads. The best bit is that it doesn’t impact the functionality of the board, as the gold plating still takes priority over the print when they clash. I like how the big print turned out – what do you think? The prototypes you see in the images and videos was made by OSH Park. They’re a pretty respected board house in the USA that offer really great value on small prototyping runs. This is why I used them for this project, as some of the Chinese manufacturers have a 10+ minimum and come with the DHL charges and taxes when the delivery hits our little island. However OSH’s PCB spec is always ENIG plating and purple in colour – they don’t offer any other options which can be a limitation for some people. 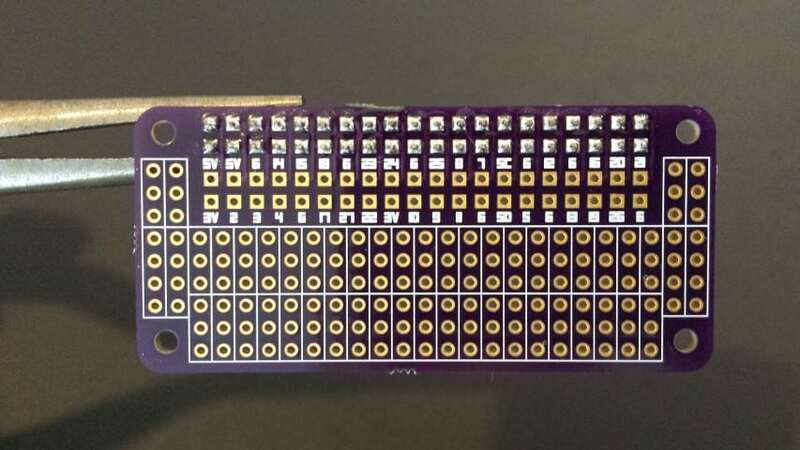 Although I quite like the Purple/Gold colour scheme, all of my other ProtoBoards designs have been Black/Gold. I’m torn, so will let the pricing make the decision for me as different quantities make one manufacturer cheaper then the other. 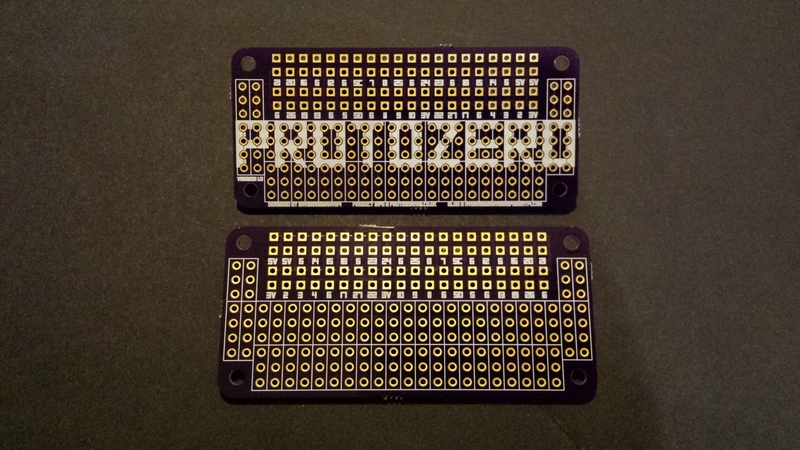 Depending on how many backers I get, I may choose to use the same board house I used with the ProtoCam+ and ProtoPal, which will also allow me to make the ProtoZero PCBs in black. Might as well mention the packaging as some people are in to that sort of thing. The Kickstarter campaign shows a clear bag being used, but I’m going to opt for a solid black bag for the final product. Other than that, the same approach will be taken as my previous campaigns – a grip-seal bag, white label and bubble mailer. This was possibly the hardest part of setting up this Kickstarter campaign – setting a price. The pledges work out at £5 per kit, including postage to the UK (and +£3 to anywhere else in the world). Your guaranteed first impression is “That’s more than the cost of the Pi Zero”. You’re right, but there’s nothing I can do about that. 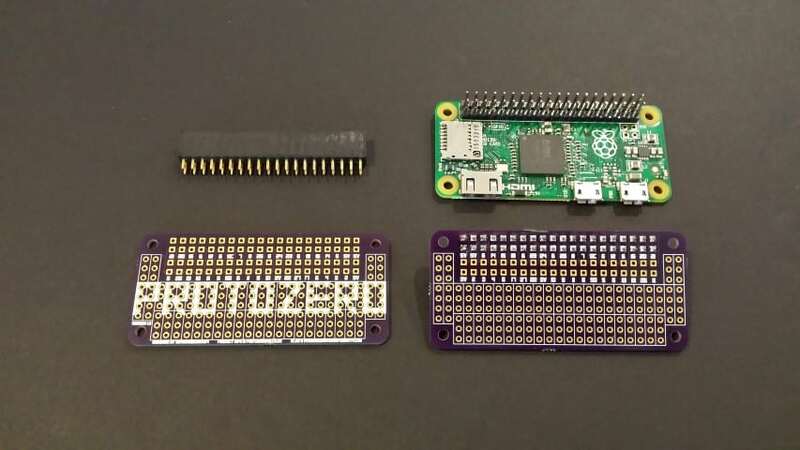 The Pi Zero has been made in such an efficient way that they’ve managed to cut the costs right down. I’m sure this low price is also to do with the sheer number of these Pis that they are making and/or planning to make, and other factors that a large company/charity can take advantage of. Being at the ‘bedroom DJ’ level of product design, you have none of those benefits to work with. It’s you vs a lot of manufacturers that aren’t all that interested in orders of just 100-200 pieces. You get all of the work and none of the discounts. I’m doing this for the fun of it mostly, but of course it’s always nice to turn a little profit at the end as well. However I can honestly say this project has the lowest margin of all my ventures to date – so this one’s definitely more about the love and fun of it (because if it isn’t, then I’m not sure why I’m doing it!?). 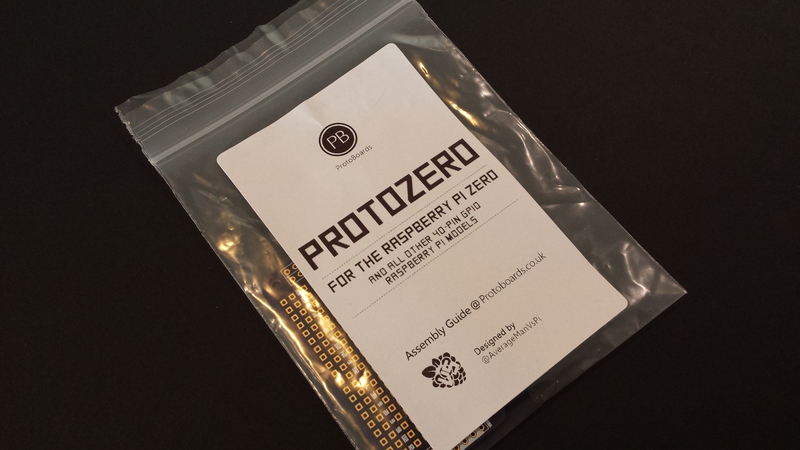 Hopefully you’re now hungry for a piece of ProtoZero. I bet there’s a few projects, past or present, that you’re now looking at thinking “I bet I could fit that on a ProtoZero”. There’s also the possibility that this is the first ever Pi Zero based Kickstarter campaign! For £5 I think it’s one of those fun and totally affordable Kickstarter projects that are just exciting to back and follow. It’s going to be a fun ride with lots of updates and hopefully interaction and comments from backers, let alone all of the cool projects that pop up after backers receive the final product. Finally – a massive thanks to everyone who backs the project! 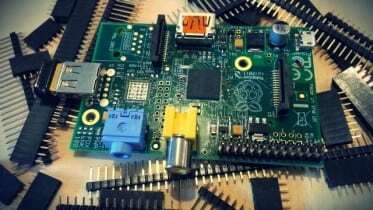 Be the first to comment on "ProtoZero Prototyping Board for the Raspberry Pi Zero"